"Louder Than Love - The Grande Ballroom Story", produced and directed by Tony D'Annunzio, is coming to home video on June 10 via MVD. The film has been to over 35 festivals from Detroit to L.A. to London and Australia. "Louder Than Love" debuted to standing ovations at the world premiere April 5, 2012 at the Detroit Film Theatre at the Detroit Institute of Arts, followed by 35 different film festivals across the globe including sold out screenings at Rock and Roll Hall of Fame and Museum, Nashville Film Festival, CBGB / NYC Music & Film festival, Sheffield Doc/Fest and Australia DocWeek. It screened at the Traverse City Film Festival and was personally handpicked by Michael Moore, who described it as "an amazing look back at the talent and creative culture produced in this state." It has won numerous awards including Best Doc at Las Vegas International Film Festival and D'Annunzio was nominated for Best New Film Director at the LA New Directors Film Festival. Most recently, the film was broadcast on PBS and became one of their best received pledge drives. 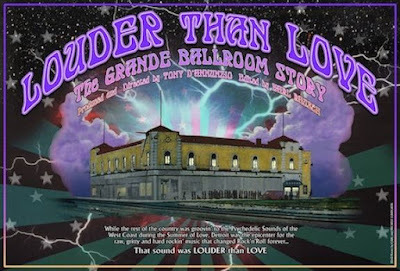 D'Annunzio said: "The Grande Ballroom era is potentially the greatest untold story in rock and roll history. With everything Detroit has been through in the last several decades, I wanted to let folks know that aside from the automobile industry, the city has some amazing musical history which helped shape American pop culture."